Once a month, we'll be taking a look at fashion in film--characters, colors and costume design. Working together to create a believable persona, in the movies, the clothes often quite literally make the man. In the case of today's characters, they make the group of teens that became pop-culture icons in the mid-1990s. Loosely based on Jane Austen's Emma, Clueless (1995) centers on the ditzy but well-meaning Cher Horowitz (Alicia Silverstone), a Beverly Hills teen. After successfully playing matchmaker to two nerdy teachers in the hopes of getting each of them to let go of their stringent grading standards, Cher embarks on more good deeds--mainly teaming up with her best friend Dionne Davenport (Stacey Dash) to give new student Tai Frasier (Brittany Murphy) a style and popularity makeover. Of course, trouble follows soon after--Cher's own popularity, love life and driving test go awry, leaving her feeling totally clueless. Cher wasn't clueless, however, when it came to fashion, thanks to the vision of writer and director Amy Heckerling and costume designer Mona May (also known for her work in 2007's Enchanted). "When Amy wrote Clueless, the current fashion was grunge," May told Hint Fashion Magazine in an August 2010 article. "Her vision for the film was to show the rich, upscale high school girls of Beverly Hills. The costumes were to be like characters in the film. ... The clothes needed to be very bright and fun. I wanted the girls to be girls again, with over-the-knee stockings and Mary Jane shoes. We wanted to change the current look that was on the street and show teens how to have fun with clothes." Designer Jill Stuart was behind the recognizable (and, in 1995, immediately parroted) plaid skirt suits. They were part of her first-ever collection, based on her daughter's school uniform--and they served as inspiration for her fall 2010 collection. Azzedine Alaïa designed the red dress Cher wears to a party in the Valley. Alaïa, known for slinky, clingy ready-to-wear, saw a popularity peak in the 1980s; by the time Clueless was made, he'd started producing clothes for a private clientele. The dress Cher wears is the focus of a particular exchange in the movie, recounted by Vevant's Colleen Nika: "Horowitz memorably chastises a pickpocket for forcing her to ruin her red designer dress. 'This is an Alaia,' she pronounces, eyes open wide. The potential destruction of the garment is a far more pressing concern at the moment than the gun pointed at her temple. 'An-a-what-a?' the clueless fiend frowns (as did 90 percent of the movie audience, no doubt). 'Like, a totally important designer,' Cher sighs, with an eyeroll. Duh." Calvin Klein was responsible for the white slip dress Cher dons for a college party--it was also the object of another funny exchange. "What are you wearing?" Cher's gruff father asks her. "A dress," she says. "Says who?" he asks. "Calvin Klein," she answers. Calvin Klien still calls it a dress, too, and one you can purchase--house director Francisco Costa reproduced the dress for Confederacy Boutique this year, where it's available for $915. "Amy loves fashion and we had a great time looking into current European designers and what they were doing on the runways," May said. "It takes eight months to make, edit and release a movie. I had to intuitively pick the trends that I felt would still be current in eight months' time. We also had to make sure the trends and fashions translated into the lives of teen girls. "Fashion is one thing and creating real characters on film that people can relate to is a whole other thing," she said. "It was wonderful to be able to work in these two worlds and bring high fashion onto the big screen." Nothing gets too serious in Clueless--it hinges on jokes and references and mid-'90s slang, and viewers know from the beginning these kids are going to bust their stereotypes for a happy union. It's a film of, ultimately, youthful exuberance, and the wardrobe is accordingly bold and bright and fearless. And really, it's appropriate that a movie so dependent on pop culture gained the place it did within pop culture. Said Nika, "Superficially, it was fabulous. Symbolically, it represented a shift in '90s aesthetics." 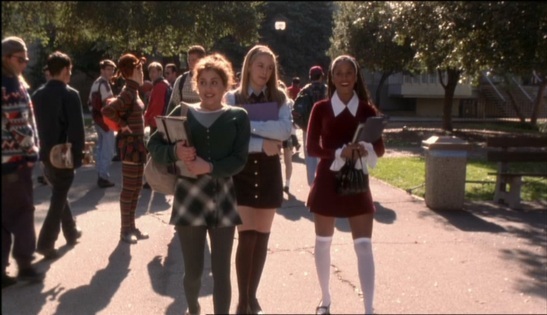 And in 2010, with runways full of over-the-knee socks, crop-tops, kilts and plaid--and a number of blogger and commentator associations between fall's collections and the Clueless cast--well, it seems Cher and Co. really did have a clue after all. Awwwww this used to be one of my favorites! !